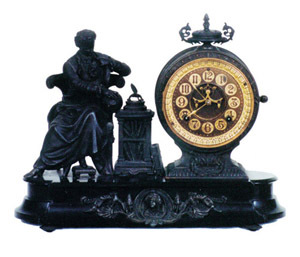 Ansonia Clock Co. figural clock, "Newton", ca 1894. Originally was Japanese Bronze, now very dark, almost black, matching the black iron base. Looks great with the dark dial, slim brass hands, etched brass numerals, open escape, machined bezel, beveled glass. 8 day, half hour and hour strike, correct pendulum, and running. Clock is 17 1/2 inches wide, 13 1/2 inches high. Ly-Ansonia No.512, dial like No.509.